Albert Mangelsdorff surely is one of the most remarkable figures on the german jazz scene and - in spite of working mainly in germany - a internationally renowned and respected jazz capacity. 1928 Albert Mangelsdorff is born in Frankfurt am Main on September 5th. His older brother Emil introduces him to Jazz at the age of 12. "In the evening when my uncle and my aunt went out to the theater, I listened to the so called ´enemy station´, which was officially illegal. They had a lot of jazz playing, lots of Glenn Miller of course, but also such as Count Basie and Duke Ellington, which I was interested in much more. At that time I was already influenced by my brother and his friends, who were closer to the puristic jazz". "I wasn´t ready yet to play guitar with them (the jazzband of Horst Lippmann and Carlo Bohländer) so I played with some others dancing gigs on every wednesday at a pub in Eckenheim". "Quite early I was interested in the trombone. ...occasionally I said: I play the guitar but I´d rather be a trombone player. This was long before I became a professional musician"
1947 Mangelsdorff switches finally to the trombone. 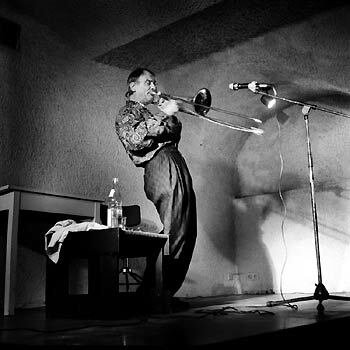 "It was probabely at the end of ´47 when a colleague, Kurt Dori, who later played with the Heinz Demmer band, organized a cheap trombone for me. After a few weeks of fooling around I looked for a teacher, since everybody told me: If starting with the trombone, you should take lessons right away. ...In Fritz Stähr, the solo trombonist of the Frankfurter Oper, I found a teacher who cared very much for me. He gave me lessons once a week, but out of one hour he made two or three since he noticed that I was diligent and always well prepared. Even so I lost courage from time to time. The trombone is a very difficult instrument and progress is only slow." An essentiel influence in this time is the music of Lennie Tristano. "(I) was immediately thrilled by that sound and that way to play." "When I look back again and ask myself what was so fascinating to me of Tristano´s music, it was probabely the inner logic found in this lines." 1953 Mangelsdorff plays in the band of Joe Klimm. 1953 Changes to the Hans-Koller-Band. 1957 Records in a duo with Attila Zoller. 1957 Mangelsdorff becomes a member of the "Radio-Tanzorchester des Hessischen Rundfunks" (Radio-dance orchestra of the hesse radio). However the music he has to play there is hardly jazz. "That sweet stuff sucked after a while... I went every evening to the Jazzkeller, but had to be back at the radio station at 10a.m. and in addition I was practicing part of the day." 1957 Mangelsdorff becomes the leader of the "Jazz Ensemble des Hessischen Rundfunks". 1958 As a member of the "International Youth Band" Albert Mangelsdorff participates on the Newport Jazz Festival in the USA. "Being part of the Newport-Jazzfestival in 1958 was an important experience, almost a decisive point in my career, by the many musicians alone you met, by the talks that made me more and more clear-I thought in that direction anyway back then- how important it is to find your own way and not to copy anybody." 1961 The Albert Mangelsdorff Quintetts is founded, with A. Mangelsdorff (tb), Heinz Sauer (ts), Günter Kronberg (as), Günter Lenz (b), Ralf Huebner (dr). Mangelsdorff's decade long collaboration with Heinz Sauer, one of the most renowned saxophone voices in germany, is certainly one of the highlights of his work. It surely has a big influence on the development of jazz in germany. The group continues until 1971, the last two years without Kronberg, as a quartett. In 1971 a new formation emerges, again with Heinz Sauer, joined by Gerd Dudek (ts), Buschi Niedergall (b) and Peter Giger (dr). 1976 Dudek leaves, the remaining quartet lasts until 1978. The tours of various Mangelsdorff-formations through Asia - sponsored by the Goethe-Institut - raise Mangelsdorffs international reputation. This journeys have also a very strong influence on his own music, documented e.g. on "Now Jazz Ramwong". The pieces on this record are almost all inspired by melodies of different countries, from India-themes to Thai- folkdances, even the german medievial "Es sungen drei Engel". The modale structures of the traditional asian music were a perfect source for Mangelsdorff to form unconventional pieces of music. 1965 1965 The Mangelsdorff Quintett plays in Newport after winning the first place in the Downbeat Poll for "Talent Deserving Wider Recognition". He returns to Newport in 1967 and 1969. Thus since the beginning of the 60´s Mangelsdorff is also an international recogniced musician. Joe Henderson said: "He plays besides J.J. Johnson the most exciting trombone", John Lewis remarked he is the"most important innovator" for his instrument. Mangelsdorff changes to Free Jazz. He performs first Free Jazz concerts as a guest of the Manfred Schoof Quintet. A little later he meets the saxophon player Peter Brötzmann and plays in a duo with him. Within the ´Globe Unity Orchestra´ it is possible to explore Free Jazz in a bigger formation. His own quartet becomes more and more ´free´ too. After working a few years in the Free Jazz-context, however, he realizes, that he can express his ideas spontanuousely on stage but is neglecting his compositional abilities. So in the mid 70´s he grows a little bit out of this sphere though he never wants to miss this experience. "For me the ´free´playing was an immense expansion of my means for expression, that in part influenced my normal, i.e. conventional style too." 70´s His first solo-LP "Trombirds" (out of print) is recorded in 1971 . In 1972, Mangelsdorff gives a famous solo concert on occasion of the olympic games in Munich. In the coming years he cultivates his solo work. "A man, a trombone, a microphone" with "fantasy and technical competence" the musician and critic M. Naura characterizes his solo performances. This is convincingly documented on his solo record "Purity" ( Mood-Records, rec. 1990). Here one finds earth-heavy blues pieces next to tricky-simple melodies reminding of Monk. ( Mood-Records, rec. 1990). Here one finds earth-heavy blues pieces next to tricky-simple melodies reminding of Monk. Multiphonics In the course of his musical development Mangelsdorff creates a special technique that is highlighted in his solo concerts: "Multiphonics". "One plays a note and sings above it...The purity of the intervall between the played and the song note creates overtones that are made so audible by this technique that accords appear." 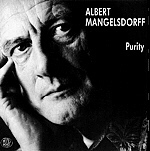 1980 Mangelsdorff is number one in the Downbeat Critics Poll. Mangelsdorff thinks that Lee Konitz had a major influence on his style. He recordes in duo with him in 1983. Another remarkable duo-record is "Two is a Company" with W. Dauner (Mood). That he still also likes big formations prooves his membership in the ´United Jazz and Rock Ensemble´ since 1975 and his activities with the´Globe Unity Orchestra´. To fence Mangelsdorff into stilistic corners doesn´t make sense anymore. He is still on ´free´ ground but one has only to pay attention to his solo record ´Purity´ from the 90´s to notice his span from blues to song to free jazz. Like any great jazz musician you can recognize him after a few notes by his unique sound and timing. His authority as a musician, the appreciation in the jazz world by colleagues, critics and audience also lead him to various music related tasks. For example since the beginning of the 90´s he is the musical director of the Jazzfest Berlin. A further sign of the high esteem Albert Mangelsdorff posses in the german jazz scene is the annual award by the UDJ (Union Deutscher Jazzmusiker) of 20.000 DM called the "Albert Mangelsdorff-price".